Summer has finally arrived! Living in the UK, we all know how delicious it feels when the days start to get longer and the early morning starts are no longer performed in darkness. Once school holidays start, you may well be planning a holiday either at home or abroad. This may include both your dog and time spent on the beach. Baggy (my cockapoo) absolutely loves swimming in the sea and can chase pebbles and toys for hours, but just like us, there are some things I need to do for him to ensure he is safe and cared for whilst enjoying the surf. 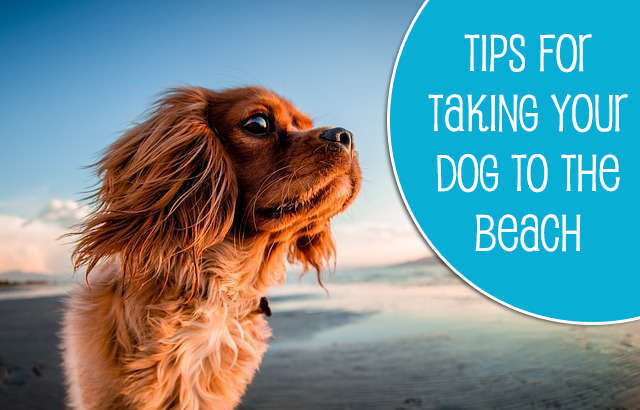 Here are some great tips for taking your dog to the beach so that you all have a wonderful time. 1. Protect those delicate doggy paw pads. Some of our beaches in the UK are stony and pebbly and the roughness of walking along these can sometimes cause small cuts on your pups paws. Make sure you check them regularly and if there is a cut, ensure you clean it well and protect it from further damage. The sand on some beaches can also get extremely hot and can become extremely for your dog’s feet very quickly. Apply a product like vaseline to those paws before hiking out to the sand. 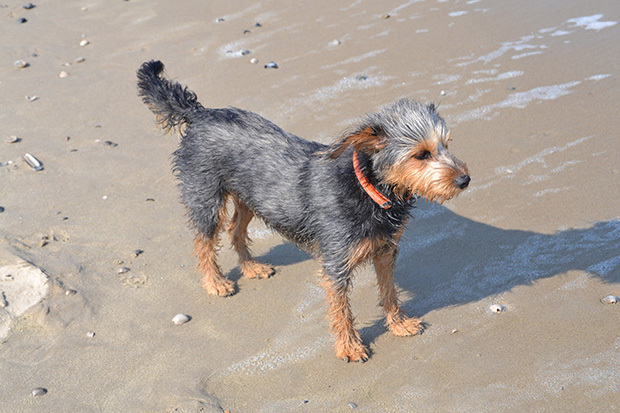 For your first trip to the beach, your dog may find the sea scary and overwhelming, so start off in a quiet area with calm water like a lagoon to see how your dog behaves. Not all dogs can swim or enjoy it, there are some who just enjoy walking along the surf, and that’s ok. Don’t try coax a dog in if he seems afraid as this will only reinforce his fear. 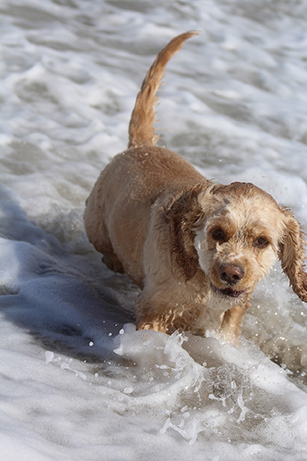 Strong currents can overwhelm even the strongest of swimmers so always keep a close watch on your dog and don’t leave them swimming unattended.Even dogs that are good swimmers can become overwhelmed by strong waves and currents, so keep a close eye on your dog at all times. Ensure you’re familiar with how to deal with rip currents and lateral currents. Even dogs that are strong swimmers and can spend hours in the surf can benefit from wearing a life vest. You will have peace of mind and the handles on the back allow you to easily lift the dog out of the water if necessary. Both people and dogs need occasional breaks from the sun. Dogs can overheat very quickly, particularly certain breeds. 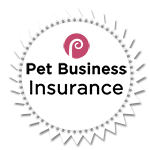 Provide a large, shady umbrella or shade tent, both you and your pup can take advantage of a bit of cool in an otherwise hot day. Dogs can get sunburnt too and there any sunscreen made for dogs or young babies is safe for you dog, just check that id doesn’t contain any zinc oxide. If you’re unsure, please check with your vet before your holiday. Sunscreen should be applied to your dog’s ears, nose, belly and groin areas. Remember to reapply regularly, just as you would for young children. Dogs can get very hot and dehydrate easily at the beach so always ensure you bring lots of cool, fresh water along with you. You may consider packing a lightweight collapsible bowl to allow your dog to drink as they struggle to drink from a bottle. This supply of fresh water will also discourage your dog from drinking too much harmful salty sea water. 7. Take more than one leash. A longer leash can give your dog more freedom on the beach. In the UK, there are strict rules about when you can let your dog walk off lead on a beach so always check. When you are allowed to let your dog off leash, make sure they are wearing a dog collar with ID. There’s nothing worse than walking or playing on the beach and coming across dog boo that someone didn’t pick up. Take plenty of poop bags with you every time you head out to the beach. If someone needs a bag, be kind and share yours ~ you never know when you may be stuck without! Most beaches are well equipped with rubbish bins, so always put them in and don’t leave them behind. If your precious pooch decides to poo in the sea, just do your best to clean it up, it’s always better than just leaving it for someone else to come across. My dog, Baggy loves to dig in the sand and always ends up looking like a bit of a sand monster. 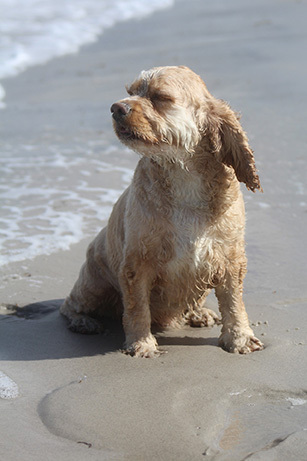 If you have a dog like Baggy, take an extra bottle of water you can use to rinse off the sand from their face. Try using a thin microfiber cloth moistened with cool water to clean around your dog’s eyes and muzzle. Things like pebbles and sharp edged shells can cut your dog’s paws so avoid places with these if you can. Areas where people fish where there’s a chance of hooks or fishing line around that can hurt your dog should be avoided. Observe them closely for any sign of limping. 11. Give your dog a clean rinse or bath. Sand and salt can be really irritating to you dog’s skin after a day on the beach. Rinse your dog off with clean water each time you come back, followed with a soothing, natural shampoo. 12. Protect their sensitive ears. Many dogs can get ear infections from being in the water so if your dog is prone to ear infections, dry their ears very well after swimming. Check with your vet about an ear rinse solution that can be used after swimming to help remove excess moisture in the ear and prevent infections. 13. Don’t forget the toys. Dog’s love chasing toys on the beach. Any toys that float are good choices for the beach. Going on holiday to the beach with your pet is a wonderful experience. Make the most of every day and enjoy each other’s company.